Welcome to the magical world of the Easter Bunny! You might like to know that none of our children’s resources are religious, they are designed to be used by anybody from any background who is looking to bring their children a bit of extra Easter fun. In 2017, Easter falls on Sunday 16th of April. 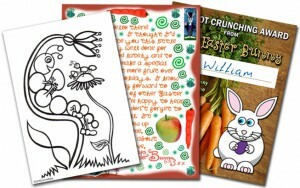 We will try to get the majority of that year’s Easter printables uploaded by the end of March so that you have plenty of time to print them, without having to run around at the last minute. Needless to say that much like Father Christmas, the Easter Bunny spends many months preparing for his special day. He takes a trip around the world every Easter Eve to deliver Easter eggs to all the girls and boys. Sometimes he hides them, just to add to the Easter morning fun. Our Easter Bunny letters are our most popular resource and if you haven’t had one before, the best one to go for is probably “My Secret Chocolate Factory“. 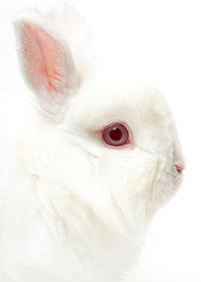 It’s suitable for bunnies who bring chocolate, sweets and/or other gifts such as painted eggs. Our second most popular bunny resources are the little notes he writes. Some of these are useful in the run up to Easter as well as on the day itself. So who is the Easter Bunny? Well, as you’ll read in Wikipedia, the Easter Bunny is “is a fantasy character depicted as a rabbit bringing Easter eggs”. However, there are all sorts of different stories told about the Easter Bunny and they can differ quite wildly from family to family, not to mention from country to country and culture to culture. In our family, we grew up with the idea that the Easter Bunny would visit on Easter Eve and leave chocolate eggs behind to eat in the morning, but other families have alternative variations of this. 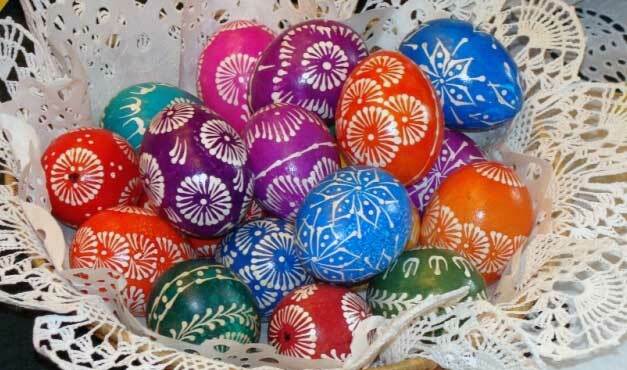 For some households, the Easter Bunny brings painted eggs rather than chocolate ones, which are used to decorate the house. Others have him bring toys instead. Then, there’s the matter of where the Easter Bunny’s gifts get left. In our house, the Easter Bunny hides the eggs around the garden if it is nice weather – and around the house if it isn’t. Helping the children look for them has become part of the fun of Easter morning for us. However, lots of people prefer not to hide the eggs but to place them somewhere where they look pretty when the children come downstairs… we have a friend who likes to make boiled eggs and soldiers for her little ones for breakfast, and places an extra egg cup with a chocolate egg in it on the plate next to the real one. She says it always brings a smile. Of course, there’s also the matter of where this magical rabbit comes from. Where does the Easter Bunny live? Egg delivering aside, there are a good many tales about where the Easter Bunny hangs his hat. Here at Rooftop Post, we go with a secret and highly magical warren underneath Easter Island, largely because we find that children just LOVE to be able to see it on a real map. The Easter Bunny lives on Easter Island of course! Or rather, under it. He has a magical chocolate factory underneath it, where he and all his helpers make the eggs – it goes deep into the earth and is hundreds of tunnels long. In your rabbit hutch! The Easter Bunny is your rabbit, but only for one night of the year. The rest of the time he’s the ordinary pet you love so much. The Easter Bunny lives in Fairyland, every year on the day before Easter, he hops over a rainbow into our world. These are but a few, there are many, many more. It’s wonderful how imaginative parents can get! For those of you who want to know more about our Easter Bunny, here’s what we tell our little ones. Feel free to borrow and/or embelish at will. Oh, and Happy Easter! Unknown to the world at large, the Easter Bunny lives deep under the Easter Island in a vast maze of tunnels and called the Wiggly Warren. Part of the warren is like a big subterranean village, full of burrows for him and his helpers and another part is taken up by a highly secret and magical chocolate factory, where he makes and stores lots of chocolate eggs. The Easter Bunny is very old and very magical. He is white with sparkling blue eyes and he dresses in a top hat and tails. Every year he sets out on the night before Easter to deliver Easter eggs to all the children who have been good. He is helped in this task by the Easter dragon, (one of the last real dragons left in the world), who lives in a cave on the other side of Easter Island. The Easter dragon likes flying the Easter Bunny around on his back on the night before Easter because it gives him the chance to get out and stretch his wings. He is very big and very purple, but he never gets spotted in the sky, because every year before setting off, the Easter Bunny’s helpers paint him with a magical potion to make him invisible. Some of the Easter Bunny’s helpers are Mr Tunneltoes, a mole who is very good at digging new tunnels and working in dark underground places, Mr Chocochops, a rather round hedgehog who is the chief chocolate taster and Potionella, a witch who brews up any magical potions he may need. There are lots and lots of others. Down in the magical chocolate factory there are a number of places you should know about. First of all, there are large rooms just below the surface of the ground, where the roots of Milk Chocolate Egg Plants hang down from the ceilings. From above the ground outside the factory, these plants look just like ordinary grass but they grow milk chocolate eggs from the their roots, which the Easter Bunny’s helpers gather up as soon as they are ripe. Then there are the storerooms, where all the sweets and chocolates are stored. These are closely guarded by magical helpers in case anyone tries to steal the eggs before Easter. Below the storerooms, there are the Silver Paper Mines, a rocky part of the factory, where magical silver foil of all different colours is dug out and used to wrap the Easter eggs up and keep them fresh. Finally, even further down than the mines, there is one of the most magical places of all. It is called The Meltmarsh – a deep swamp of warm dark chocolate dotted with little islands where toffee trees grow. The Easter Bunny didn’t create it, he simply found it when he dug deep enough, as if it had always been there. Nobody knows how big it is nor how far it stretches away into the dark. The Easter Bunny and his helpers take little boats out onto The Meltmarsh whenever they need dark chocolate and scoop it up by the bucket load. It is some of the richest dark chocolate in the world! The Easter Bunny and his helpers have a great many magical adventures in the Wiggly Warren and outside it. Who knows what he’s been up to in the run up to this Easter? But no matter what he’s a stickler for punctuality, and sure to get those eggs delivered on time.